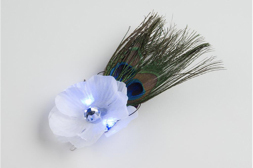 We are going to build a light-up hair clip to show you a fun and easy way to add electronics to your existing crafts. 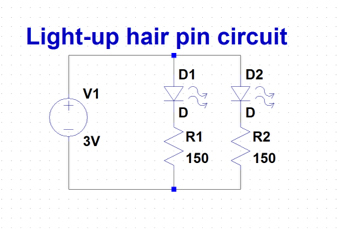 Although this circuit isn’t complex, it can add that unique touch to something like a hair clip, shoes or backpack. Need a kit of materials? Find what you need here. Not included in the kit is a CR2032 Coin Cell Battery and glue. Before we get to the construction let’s cover a few concepts. The first is wire wrapping. One of the greatest barriers to entry into the world of electronics is the cost – especially the cost of equipment. 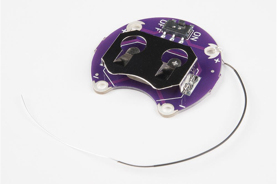 We are using a technique called wire wrapping which requires no tools, no soldering, and even though we are using sewable electronics, we won’t be using conductive thread either. 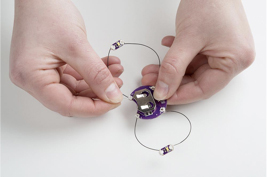 Wire wrapping is a method of constructing electronic connections by turning a small gauge wire around a post several times; or in this case, wrapping the wire around the sew tabs of a LilyPad coin cell battery holder and LED. 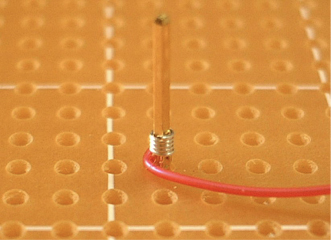 This method is ultimately more reliable for making stable electrical connections because of the amount of contact between between two connection points and there’s no chance of a cold solder joint. Another reason I prefer wire wrapping in a project like this is to reduce the possibility of a short circuit – which happened often when I was prototyping with conductive thread. Let’s take a look at the circuit and cover a few more concepts. The picture below is of a schematic which is a graphical representation of the circuit. From here we can analyze characteristics such as voltage, current and resistance; which are the basics of electricity. In a schematic there are three pieces – a symbol (drawing), a name and a value. V1 is a representation of the coin cell battery, D1 with R1 is a representation of one LilyPad LED and D2 with R2 represents the second LilyPad LED. The two LEDs are in parallel which means the voltage seen at the plus (+) and minus (-) terminals of both LEDs are equal to one another. Choosing a parallel configuration as opposed to a series configuration ensures both diodes will turn on and emit light. 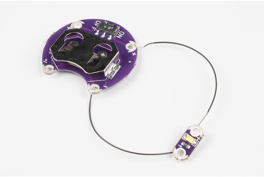 Why are there resistors on the LilyPad LEDs? These are known as current-limiting resistors. As the voltage increases across a diode the LEDs’ internal resistance drops and causes the current to draw in excess which burns out the LED. Adding a resistor in series with the LED keeps the current to a specified level called the characteristic forward current. Now let’s take a look at an easier circuit representation and talk about polarity. A polarized component can only be connected in a circuit one way. If you look at your LEDs you’ll notice a + or – symbol on each side. An LED is a light emitting diode and a diode only allows current to flow in one direction. The negative terminal is called the cathode and the positive terminal is called the anode. When putting this circuit together make sure the + terminal of the LED is connected to the + terminal of the coin cell battery holder. In same regard, make sure the – terminal of the LED is connected to the – terminal of the coin cell battery holder. Using a piece of pre-cut wire, wrap one of the exposed ends around the + terminal of the coin cell battery holder 5-7 times. Make sure to turn the insulated part (has a black plastic coating) of the wire around the tab once as well – this reduces the amount of mechanical stress on the exposed wire. Insert the battery, slide the switch to “on” and test your circuit. Do both LEDs turn on? If they do, slide the switch to “off” and remove and the battery. 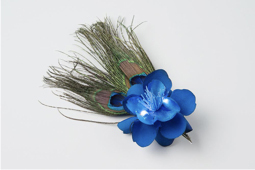 From here you can design your hair pin. I glued the LEDs onto the flower petals; this hides the electronics while still showing quite a bit of light. 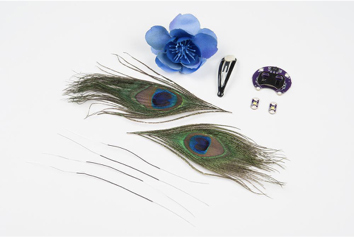 Glue the peacock feathers to the top of the coin cell battery holder and the flower on top of the peacock feathers. Once it is in place and dry you can glue the hair clip or pin to the back of the coin cell battery holder. 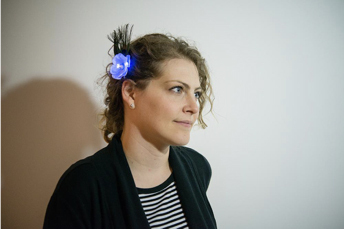 When you’re ready to show off your work put the battery back in, slide the switch to “on” and clip it in your hair. Here are two that we made. Now that you have built your own – take it apart – hack it and make it into something new, something uniquely you. Share your newly hacked project on Twitter or Instagram with the hashtag #SFE_ihackedit. Your design will gain the attention and admiration of many, including the great people at SparkFun Electronics.